Complied from over 40 years worth of poems, Nancy Campbel has gathered some of the most encouraging poems about motherhood to share with you. Many of then are challenging, some are funny, others will touch your heart strings and bring tears to your eyes as you relate with the feelings of the writers. This album of poems is designed for you to leave on your kitchen counter, living room table, or night stand. -Pick it up while you are nursing your baby and read...you'll be encouraged. -When you are feeling frazzled and need uplifting, pick it up and read a poem. -Take to bed when you are looking for something light, but enriching, to read as you rest for the night. This book is the perfect gift, a beautiful collection of thought provoking ideas, reflections and encouragement for every mom. Whether you have just given birth, a frenzied mom who needs help, or a mature mother who still loves being a mom, this book will bring comfort and peace for every condition. Order your copy of "Quiet Reflections for Mothers" for Only $10.00 (plus shipping). Better yet buy several and give them to your friends...They make wonderful gifts that will keep giving encouragement and hope to all mothers. I buy 10 cpoies at a time at 40% off which is a fantastic deal and give them away as gifts! they make great Mothers Day or Baby Shower gifts! I love this book! I buy this book in bulk (10 copies at a time) to keep on hand to give as baby shower gifts, Mothers Day gifts or any other special occasion to bless mothers in their calling! The poems are inspiring and lift and build mothers up which is exactly the opposite of what the world tries to do! My desire is to get this book in to the hands of every mom I know so that they would be inspired, encouraged and blessed! I have given this book as a gift to new mothers and mothers of new babies. It has always been well-received, with the mom's commenting on how encouraging the poems are. Excellent gift idea. 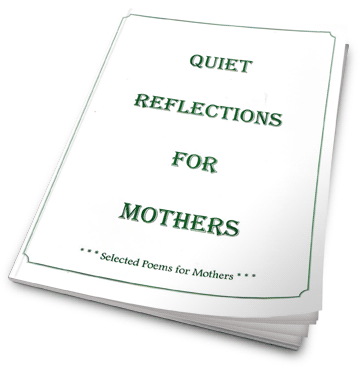 Click the button below to add the QUIET REFLECTIONS FOR MOTHERS ~ 101 POEMS to your wish list.